Since the beginning of the century, the field of architecture has fervently turned its attention to documenting the contemporary urban condition. Every city been has been examined as a repository of architectural concepts, scrutinized as an urban manifesto, and recorded as a series of found objects. The Ordinary articulates a potential genealogy for this practice and for the genre of books derived from it. 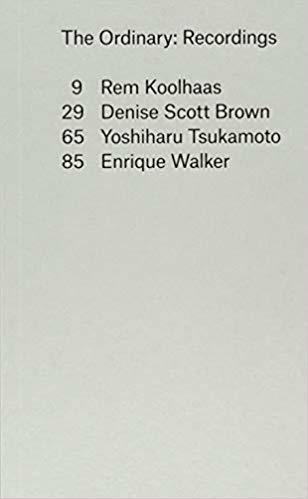 Organized around conversations with the authors of three seminal texts that document the city-Denise Scott Brown’s Learning from Las Vegas (1972), Rem Koolhaas’s Delirious New York (1978), and Yoshiharu Tsukamoto’s Made in Tokyo (2001)-this volume traces the history of these “books on cities” by examining the material they recorded, the findings they established, the arguments they advanced, and the projects they promoted. These conversations also question the assumptions underlying this practice and whether in its ubiquity it still remains a space of opportunity.